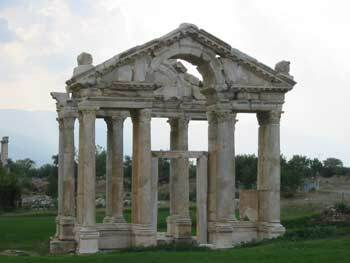 Aphrodisias is another of the larger ancient Roman sites to see in Turkey, comparable to Ephesus. Among the features worth looking at here are the Tetraplyon, the stadium and the theatre. The Tetraplyon is the now-isolated double gates that would have been the first structure seen by pilgrims visiting the site in ancient times. They stand lonely in a field with only the barest outline of the structures that once sat behind them. However, this makes the gate look even more impressive with nothing else nearby distracting your attention from its magnificence. The stadium sits just a few hundred feet away from the gates, set into a trough (natural or otherwise, who knows?). As you approach, there is little indication of its size but stepping over the rim it's immediately clear that this is a biggie - big enough to seat 20,000 spectators for the competitive sporting events that would have taken place there. We didn't have a great amount of time to admire this from above, though, as the thunder and lightning that threatened forced us to take refuge in one of the tunnels at the ends of the stadium. After the first spots of rain died down, we exited the tunnel and made our way past the Hadrianic Baths to a colonnaded street, and beyond up to the theatre. 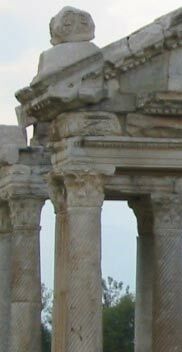 The scale of the theatre at Aphrodisias cannot match Ephesus for size or Pergamum for its location, but it is markedly more preserved than those theatres, and many others throughout Turkey. The stage area and the arched, covered area behind it were incredibly intact. A modern play could quite easily be performed at this stage - but only if the weather were better than what we experienced. Following a second round of showers, which developed into an almost torrential downpour, we escaped the exposed position and took refuge this time in the cafe area. While our group of rain-dodging travelers chatted about the day over cups of Turkish apple tea, the rain once again stopped, and the sunlight returned, adding a sheen to everything around us. I decided to go back up to the theatre to see if I could get some better shots in the slightly improved conditions. I tried to convince Robert to come along too (he had missed it out when the heavens opened), but he looked at his coffee and evidently had to weigh things up: coffee or theatre, theatre or coffee? "But you can have a coffee anywhere, Robert," I reasoned. In the end we reached a compromise - he got to stay and drink his coffee while I took his camera with me! I sensed that Robert was reaching saturation point as far as visiting 'rubble sites' went! Overnight, we stayed at the Aphrodisias hotel, which faces the stadium and is the only hotel nearby. Correction. It's the only building bigger than a shed nearby. From the terraced restaurant we could see one main road, a dirt track and a herd of goats and sheep. The hotel only served one purpose - as a stopover between places, catering for visitors to the Roman site. Our evening meal was proof again that Turkish food could be excellent value. I had a meal of buffet starter (with plenty of choice), a main course, a desert (a delicious baklava) and tea. It all came to 7 million TL, or £3.10. Over dinner we were entertained by a local musician (whatever local means in this region) to which driver Safet and tour leader Neil had a bit of a dance (the Turkish do like a dance, it has to be said). I was further entertained by Eric's notion that there is a football team in England by the name of 'Twotford Wanderers'. He tried to clarify that it was the team Elton John had something to do with. I tried to explain, using gentle language, what the name implied to an English mind. Or at least to me and Neil (he agreed that it sounded rude ... And added a further rude variation for good measure).